The history of zippers could be traced to Whitcomb L. Judson who was reported to be a lover of gadgets and machines. He got his idea for a “clasp locker” when a friend complained of a stiff back after trying to fasten his shoes. Elias Howe, who invented the sewing machine, received a patent in 1851 for an “Automatic, Continuous Clothing Closure”. Perhaps because of the success of his sewing machine, he did not try to seriously market it, and missed out on any recognition he might otherwise have received. Forty-two years later, Whitcomb Judson, who invented the pneumatic street railway, marketed a “Clasp Locker”. The device was similar to Howe’s patent, but actually served as a (more complicated) hook-and-eye shoe fastener. Whitcomb launched the Universal Fastener Company to manufacture the new device. The clasp locker had its public debut at the 1893 Chicago World’s Fair and met with little commercial success. 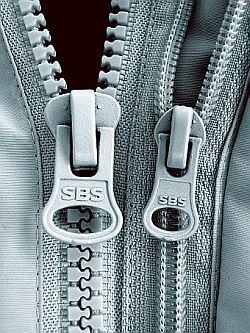 Gideon Sundback, who was an employee of Whitcomb Judson’s and a Swedish born scientist, invented the modern zipper in St. Catherine, Ontario, Canada in 1913. Unfortunately, Sundback’s wife died in 1911. The grieving husband busied himself at the design table, by December of 1913; he came up with the modern zipper. His invention was based upon the previous work of other engineers such as Elias Howe, Max Wolff, and Whitcomb Judson. The patent was issued in 1917 under the name separable fastener. The name zipper was created by B.F. Goodrich who used the device on their new boots. Initially boots and tobacco pouches were the primary use for zippers and it took another twenty years before they caught on in the fashion industry. Sundback increased the number of fastening elements from four per inch to ten or eleven had two facing-rows of teeth that pulled into a single piece by the slider, and increased the opening for the teeth guided by the slider. Sundback also created the manufacturing machine for the new zipper. The ‘S-L’ or scrapless machine took a special Y-shaped wire and cut scoops from it, then punched the scoop dimple and nib, and clamped each scoop on a cloth tape to produce a continuous zipper chain. Within the first year of operation, Sundback’s zipper-making machinery was producing a few hundred feet of fastener per day. Only after Gideon Sundback, had remodeled Judson’s fastener into a more streamlined and reliable form, was the fastener a success. One of its first customers was the US Army. It applied zippers to the clothing and gear of the troops of World War I. The product became popular when Goodrichs decided to market galoshes with Sunback’s fasteners. A Goodrich executive is said to have slid the fastener up and down on the boot and exclaimed, “Zip ‘er up,” echoing the sound made by this clever device and the fasteners came to be called “zippers.” Registered in 1925, zipper was originally a B.F. Goodrich trademark for overshoes with fasteners. After a slow birth and years of rejection, the zipper found its way into everything from plastic pencil cases to sophisticated space suits. The next big boost for the zipper came when zippers could open on both ends, as on jackets. The zippers used today are little different then the Gideon Sundback design of 1917. Today the zipper is everywhere, in clothing, luggage and leather goods and countless other objects.